This is a colour photo taken by Dean Franklin of the Mount Rushmore Monument as seen from the viewing plaza. It includes all four presidents, George Washington, Thomas Jefferson, Theodore Roosevelt , and Abraham Lincoln. The background sky is crystal blue with barely a cloud on the left side of the photo. The shot is from the ground looing up at the presidents, trees can be seen on the side of the mountain. 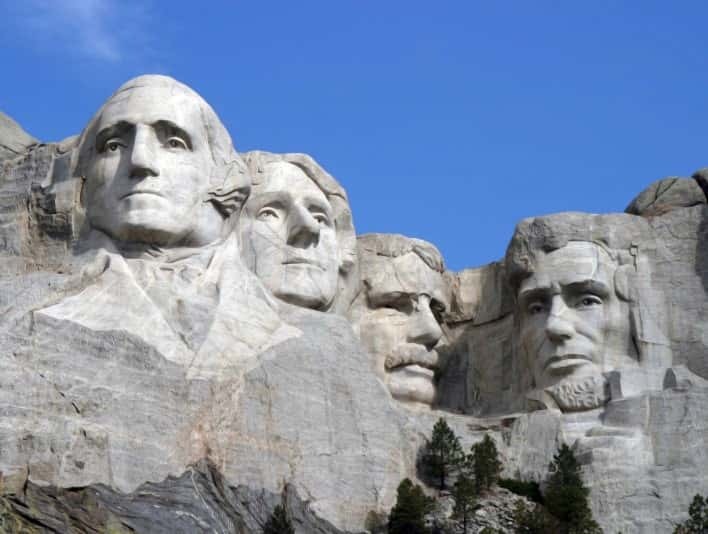 Tool marks can be seen aross the face of the mountain from the process of clearing the mountain to extricate the presidential faces.